EGO means to rule over, but ECO means to be equal. 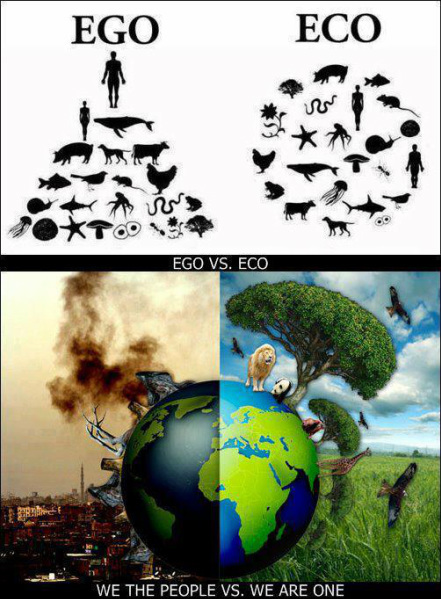 Look down at the pictures, which one do you want it to be, EGO or ECO? EGO means to rule over some people or someone . Have you ever done that before? ECO means to be equal with others and respect, care and be kind. Would you being equal or not? Read the quotes which one do you like? EGO or ECO? Tell us in your comment. This quote is saying that we should respect everything, not just rule over it. ﻿EGO means to rule over others and the world can look like a really dirty planet that once was beautiful. If it was like this where are we going to live?